Condition of Mr. Segundo: Avoiding the seemingly erudite man with the flamethrower. Subjects Discussed: Professional doodling, italics that represent facial expressions, acting out dialogue, the protracted difficulties of editing, the creative benefits of neurosis, thinking of an audience vs. writing in a distinct voice, maintaining lists of words, bulleted lists within the novel, the relationship between the equal sign and character consciousness, writing lengthy scenes that involve the anxiety of waiting, working from a journal to get at feelings within fiction, playing games in novels, aversion to mainstream narratives, the burden of universality, the novelist as an authoritarian figure, David Foster Wallace as a distinct author who reached a mass audience, “Good People,” the cycle of abuse that runs through Xerxes, missing daughters, how women relate to men, character names and explicit historical associations, the Americanization of Iranian names, truncated names, contrast and comparison with Sam and Suzanne, how 9/11 transformed the idea of looking at other people with an open mind into something else, relying on general descriptions for physical details, keeping specific details from the reader, how far an author must go for emotional truth, going against the contract of a book, the diminished acknowledgments section between hardcover and paperback, losing old friends, reading group questions, moving into an age where 9/11 novels are going to date, Mahmoud Ahmadinejad and American diplomacy, and lucky timing with pub dates. Correspondent: So you actually added 10,000 words just in the editing process? Khakpour: Every time I edit. Everything. I have. Even with my journalism. They’ll tell me cut this piece down. And we’ll get to the editing phase. And I’ll always end up adding. Even when they tell me specifically, “Cut it down.” I don’t know what it is. Editing to me just means adding instead of cutting. It’s crazy. Correspondent: Is it possible that perhaps you’re getting questions from an editor and this influx of information causes you to think more, and therefore causes any kind of piece or novel or whatever you write to expand and protract or the like? Khakpour: Yeah. Probably, I think. I always think of my audience. And that person that I think of as my audience is very quiet and sits with their folded hands, and is very polite and approving. Correspondent: Folded hands? I didn’t have my hands folded when I read this. I want to assure you. 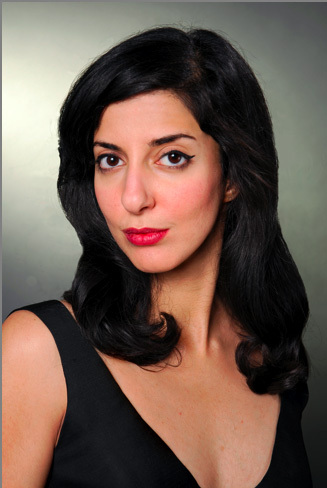 Khakpour: (laughs) It’s a good somber schoolgirl. Correspondent: Wow, I didn’t realize this. Correspondent: There should have been an etiquette guide in the paperback here. Correspondent: Thinking about the audience then makes you more neurotic. Khakpour: Overanticipating often. Yeah. I’m trying to tone that down right now. Correspondent: That’s interesting. But then to a certain degree, you have to leave things relatively organic and intuitive, and you can’t think about an audience. It’s important to have gestation here. And I’m curious if this might possibly be an issue. Khakpour: I think it is. I’m a control freak. Correspondent: You want people to like you? Really, really like you? Khakpour: Well, not even like me. But I like some control over how people are digesting my work. That’s ridiculous. But I think it also has to do with communication. And because English wasn’t my first language. I always feel like I repeat. I’m like Joe Biden. I’m often repeating the same thing over and over and over at people. “I got it the first time.” You know, there’s no need to say the same sentence over and over and over. But I always feel that people aren’t hearing me, or somehow don’t understand what I’m saying. So…. Khakpour: I think I’m going to have to back off now. I’m learning that. Correspondent: I’ve heard that Nicholson Baker — what he does is that he Control-Fs a specific phrase throughout all of his work to make sure that he has not written that particular phrase before. Correspondent: Do you have this level of detail? Khakpour: I’ll do that with certain words. Because I’ll have certain words that are my favorite word of the moment. And I’ll still — I’ll do that thing that I did when I was a young immigrant. I used to keep a list of vocab words that I loved. And even now, there will be some word every once in a while on a little list by my desk. Like I like that word! Let’s use that word somewhere. Correspondent: You actually have a list of words by your desk? Khakpour: Yes, sometimes I do that. Correspondent: The words I have to include in the book. Really? Khakpour: Yeah. And they’re not like ten dollar words. Khakpour: Or hundred dollar words. But they’re just interesting or strange. Or words. Or unusual usages. I’m often very much tried to find the Find function or the Replace function. So I’ll have to double check and make sure I don’t use that word several times. But it’s usually on a word level there.